4 Pin IDE to 15 Pin SATA Power Y-Splitter Cable Features: Most modern SATA drives do not use the standard type power connector as fitted to older IDE/ATA hard drives. 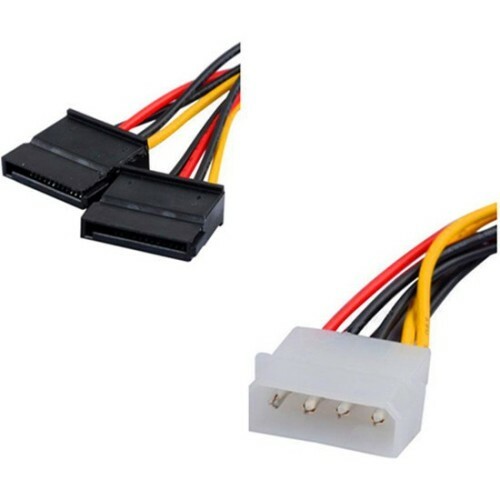 This adapter cable converts the 4 pin power connector from your PCs power supply into two 15 pin connections suitable for use with SATA drives. 15 Pin SATA Power Cable is suitable for use with SATA drives. 15 Pin SATA Power Connector (Female) to 4 pin Power Male Internal Power Cable. Converts the 4 pin power connector into two 15 pin connections.